The Red Sox and Yankees meet in the postseason for the first time since 2004.
gfoster (Geoff Foster, sports editor): Welcome to FiveThirtyEight’s postseason MLB chat. We are done with the one-game wild-card playoffs. We are done with the one-game playoffs to figure out who would play in the one-game playoffs. And the Oakland Athletics and the Chicago Cubs are the first casualties of October. I think Oakland has to be pleased they made it that far with their ragtag team of relievers and .247 hitters, while the Cubs probably had higher hopes for 2018. They now have a two-year World Series drought in the works. But on to the division series! We are going to go through all four matchups. Let’s start with America’s two most lovable teams: the Boston Red Sox and New York Yankees, who are playing each other for the first time in the postseason since 2004. This was inevitable wasn’t it? Boston gets to potentially start Chris Sale twice in five games; does that give them the edge? travis.sawchik (Travis Sawchik, baseball writer): Assuming Sale is 100 percent, starting arguably the most talented pitcher in the AL potentially twice is a huge edge. But Sale landed on the DL twice in the second half (left shoulder inflammation), and his velocity has trended down, which is a troubling indicator. neil (Neil Paine, senior sports writer): And that’s kind of concerning if he doesn’t live up to his usual expectations. Our model gives the Sox a 57 percent chance of winning the series, but that’s partly a function of the large pitcher adjustment it gives Sale. 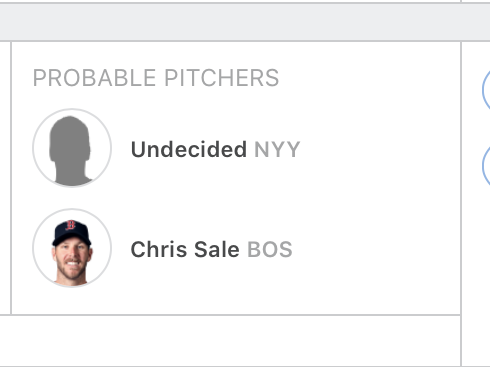 With Sale at home in Game 1, we give Boston a 65 percent chance of winning that game; with a generic pitcher in the same situation, Boston would only have a 57 percent chance of winning. gfoster: David Price has to be a concern for Boston. He’s really been terrible in the postseason, after those early heroics as a relief pitcher for Tampa. He’s also gotten bombed by the Yankees this year. travis.sawchik: David Price career postseason: 2-8, 5.03 ERA. David Price career vs. Yankees: 15-14, 4.90 ERA. Price is fatigued from discussing his issues in postseason and vs. the Yankees, but they have to be a concern for the Red Sox. And the Red Sox bullpen is arguably only stronger than Cleveland’s in the AL field. That makes Sale so important for Boston. sara.ziegler: The Red Sox bullpen is obviously an issue — at least getting to Craig Kimbrel. The Yankees look like they’ll be starting with J.A. Happ in Game 1.
sara.ziegler: Aaron Boone is all talk on bullpen games. He says he’s open to them, but I doubt he’ll actually go through with it — particularly in light of how it worked out for Oakland on Wednesday. neil: And for the Red Sox, I’ve seen a lot of worry that the 108-win season will all be for naught. Maybe that’s New England pessimism talking, but I think they also probably played a bit above their heads this year. Either way, a 100-win team will be going home, which is kind of sad this early in the postseason. gfoster: Why is New England pessimistic? Are they disappointed by two decades of NONSTOP TITLES? neil: LOL. Old habits with the Red Sox, I think. sara.ziegler: The Red Sox have to have the edge in batting, right? Because of the aforementioned Betts and Martinez? travis.sawchik: I think the Yankees and Red Sox are pretty similar in terms of overall offensive production. Two elite lineups. FanGraphs has Yankees with a 111 wRC+, Red Sox 110 wRC+. travis.sawchik: Red Sox hitting coach Tim Hyers has done a good job with getting even more out of Betts, who has worked with Hyers and Martinez on increasing his power profile. The Yankees are all about launching baseballs into the air … and bullpenning … and throwing a lot of breaking balls. Modern baseball will be on display. gfoster: Sara, I also wonder if we have not seen the full potential of the Yankees lineup, even despite all those wins. Aaron Judge has been injured, Gary Sanchez has been awful, Giancarlo Stanton started slow. They were never at full capacity it seemed; Didi Gregorius basically carried them for a month early on. gfoster: Aaron Hicks is going into monument park. sara.ziegler: Hicks has been great, I’ve heard. sara.ziegler: I’m having a hard time getting excited about either of these teams, since this series seems to have been written in stone for a while. That’s part of the problem with the AL. gfoster: Let’s go to the National League. The first series up this afternoon is Colorado vs. Milwaukee, which carries less cachet and less breathless announcer speak but is interesting nonetheless. neil: Well, I for one am curious about how a pitching-centric team like Colorado will perform. gfoster: Travis, you were doubting that Colorado would make it; are you surprised they are here, or have you come around on the Rox? travis.sawchik: The Rockies are such a weird team. They are a pitching-first team with one of the worst offenses (25th in majors in wRC+) and outfield defenses in baseball, and they make their home in the most offensive environment in baseball, with one of the largest outfields. They committed $106 million to free agent relievers, but Jake McGee and Bryan Shaw (two of those high-priced investments) have been poor, while a reliever left off last season’s postseason roster, Adam Ottavino, has been amazing. I like the Brewers in this series given the strength of their lineup and bullpen. The Brewers seem like the rare team that won the offseason — Christian Yelich, Lorenzo Cain and Jhoulys Chacin were all key offseason additions — and its division. neil: They’re also the spitting image — in many ways — of a world champion: The 2015 K.C. Royals. So clearly, Milwaukee will storm through the postseason. sara.ziegler: And win the World Series against a team from New York, Neil? neil: I’d be happier with that this time around. sara.ziegler: The Rockies will have played three games in three different cities in four days. And one of those was in 13 innings. travis.sawchik: Brutal schedule stretch for the Rockies, for sure. At least they could just bus up I-94 after the wild-card game. sara.ziegler: I wonder if they got stuck in traffic in Kenosha. As one does. gfoster: It’s just ridiculous that these series are five games. And that the schedule is so condensed. Why are they even playing today? Give them another day!! In the NBA, the playoffs last five months and no one seems to be bothered. travis.sawchik: This is strange to say, but the Rockies actually hold a starting pitching edge in a postseason series. neil: Well, hasn’t that usually been the case with the Rockies’ best teams after adjusting for park? We think of the Rockies as an offensive powerhouse, but they never can hit away from Coors. Even this year, they had a .665 road OPS. travis.sawchik: Yeah, the Rockies’ best teams have typically had above-average starting pitching when adjusting for park and run environment. By ERA-minus, this is second best pitching staff in Rockies’ history. I’m not sure many people realize how good German Marquez and Kyle Freeland have been for Rockies in second half. Only Jacob deGrom has been more productive than Marquez in the second half as an MLB starting pitcher. sara.ziegler: Meanwhile, the Brewers didn’t get here with their starters, obviously. But the bullpen is just outstanding. Can it hold up under the pressure of the postseason? gfoster: OK, let’s shift back to the AL. Indians-Astros is really the ALCS we were all expecting last year, as both teams were 100-plus game winners. Are these teams better or worse than their 2017 versions? travis.sawchik: The Indians are weaker than they were a year ago when they entered the postseason with the game’s best run differential and the to-be-named AL Cy Young winner in Corey Kluber. They’re dealing with a significant injury as Trevor Bauer suffered a fractured ankle in August, and his velo was down in his brief return. Their top starter in the regular season going into August, Bauer will begin the series in the bullpen. The Indians’ bullpen, once a strength, was the weakest in the playoff field in the regular season. Though a healthy Andrew Miller could change that. neil: The Astros might actually somehow be better. Hot take: They’re the best team in MLB, despite an inferior record to the Red Sox. (At least, that’s what our Elo model thinks.) They had 109 Pythagorean wins! Who does that?? sara.ziegler: The Astros are so weird. Their biggest names weren’t that good! And yet here they are, better than last year. They have Alex Bregman to thank, I guess. neil: It helps to have that ridiculous pitching staff, too. neil: They had the best FIP in the league by a mile (3.23; next best were the Dodgers at 3.60). travis.sawchik: The Astros are so talented. The defending World Champs basically added an ace — Gerrit Cole — and an MVP candidate (Bregman breakout) since we last saw them in October. gfoster: I’m interested in how big a role Josh Donaldson plays for Cleveland. He seems healthy finally. sara.ziegler: He better perform offensively, given that his presence has messed with Cleveland’s defense — pushing people into different positions. travis.sawchik: Well, another bat relative to the lineups they are facing in the AL field. The Indians rank last in remaining AL teams in wRC+, third in runs. neil: There are some real question marks surrounding Cleveland’s bullpen, though. They finished 26th in relief WAR this season. gfoster: Even with Brad Hand? neil: Hand has definitely stabilized things some, and Andrew Miller is back after missing a huge chunk of the reg season. But Cody Allen was pretty mediocre this year (93 ERA-plus). travis.sawchik: The Indians thought their bullpen was such a problem that they traded their top position player prospect, Francisco Mejia, at the deadline. Trading a consensus top 50 prospect for a reliever is apparently the thing to do at the deadline nowadays. travis.sawchik: One concern with the Indians is some of their players are trending down at the wrong time again. Jose Ramirez, an MVP candidate (favorite?) at the All-Star break, hit .223 in the second half. Ramirez has really struggled with breaking pitches. I’ll be interested to see how many fastballs he sees in series against an elite fastball team in the Astros. Could be a fascinating strength on strength: One of the game’s best fastball hitters (Ramirez) vs. the elite four-seamers of Justin Verlander and Cole. gfoster: OK, let’s talk about the last series, and then I’m going to ask for predictions. The Braves return to the postseason, perhaps a little earlier than some expected, and will take on the Dodgers, which was the last team they actually played in October in the NLDS in 2013. I literally have zero memory of that. sara.ziegler: That was 10 lifetimes ago, Geoff. gfoster: Those Braves had Uggla, Kimbrel, Jason Heyward, Brian McCann, Andrelton Simmons and two Uptons (B.J. and Justin). The only guys of note still there are Freddie Freeman and Julio Teheran. neil: As far as five-year rebuild plans go, that’s pretty impressive to fully tear down and build back by now. travis.sawchik: Only the Yankees have a younger group of positional players than the Braves in the playoffs, with Ronald Acuna Jr. and Ozzie Albies and maybe Dansby Swanson. It’s a pretty strong under-25 core. Atlanta is ahead of schedule and trending up. sara.ziegler: And on the other side, remember a month ago, when we thought the Dodgers might not make the playoffs? On Sept. 6, our model gave L.A. a 55 percent chance of getting here. neil: That remains incredible, given that they finished with 102 Pythagorean wins. travis.sawchik: The Dodgers are the most talented NL team in the field. They lead baseball in position player WAR and are fifth in pitching WAR. And it feels like the Dodgers have never been right all season with injuries to key stars like Clayton Kershaw and Corey Seager. L.A.’s Walker Buehler looked like an ace in Game 163 vs. Rockies. He’s another wild card in the postseason. Big time young talent. gfoster: I was just going to say that I wouldn’t be surprised if Buehler is one of these young pitchers who makes his name with a great October, much like Madison Bumgarner did a few years ago. neil: Sara, you were an early adopter on Muncy in fantasy. sara.ziegler: I was! Before I could remember his first name. travis.sawchik: Muncy has been an amazing breakout story. sara.ziegler: The Dodgers had a hard time finding a consistent spot for him during the season. They shouldn’t make that mistake in the postseason. gfoster: I’m interested to see which Kershaw we see: the one who has been the best pitcher in baseball for a decade or the one who has been one of the most disappointing playoff pitchers over the past decade. travis.sawchik: Kershaw has suffered a loss in velocity and overall swing-and-miss capability. In 2015, his fastball averaged over 94 mph; this year, it was 90 mph. gfoster: Is he throwing the breaking stuff more? Making his metamorphosis into a crafty old lefty? travis.sawchik: Kershaw has had a curious spike in spin rate on his fastball, which is highly unusual to accompany a velocity decline. neil: But enough about the Dodgers! The Braves are good, too. neil: Yes, he is quite good! In fact, the Braves have a ton of position-player talent. They were seventh in WAR from batters this year. But eight of their top 10 most valuable players were position players. Pitching-wise, there are questions. sara.ziegler: Don’t forget Mike Foltynewicz, though! I love pitchers like that who come out of nowhere. travis.sawchik: I’m pretty bullish on the Braves’ future, but there are questions on the pitching end, as Neil said, and the Dodgers seem like the NL’s only “super team,” whereas there are three or four in AL field. gfoster: OK, let’s get the World Series prediction. I want to see winner, number of games, MVP. And you will all be judged on these for 12 months. sara.ziegler: I’m gonna go with my ❤️. Brewers over Astros in seven, Christian Yelich MVP. travis.sawchik: I think we’re headed for an Astros-Dodgers WS rematch. Houston over L.A. in six. Bregman MVP. gfoster: Yankees over Dodgers in five, Gleyber Torres MVP. sara.ziegler: I mean, at least go Luke Voit as MVP. gfoster: I was considering Voit. It won’t be Judge or Stanton; if the Yankees win, they will get an incredible hot streak from someone less expected. I do feel like the Yankees haven’t experienced a true Stanton home run barrage like he had for the Marlins several times last season, so maybe that’s due? travis.sawchik: I guess the model and I are in this together. neil: It’s generally better to be on the model’s side, I’ve found. gfoster: No love for the Indians here. neil: I couldn’t pull the trigger with that Astros matchup. travis.sawchik: Too many questions for Cleveland, IMO. gfoster: OK, thank you all. Enjoy the baseball! Check out our latest MLB predictions. Averaging together the versions found at Baseball-Reference.com and FanGraphs.